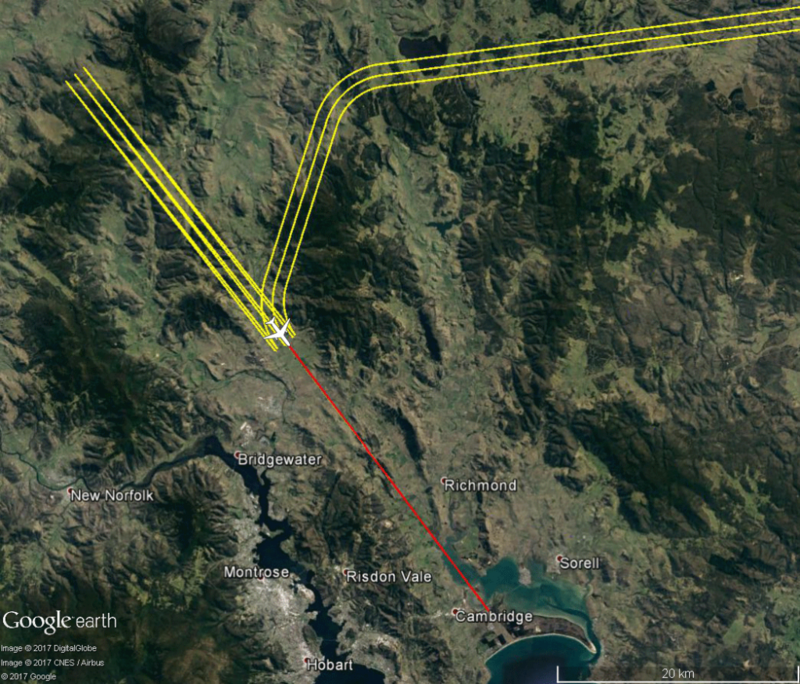 Following the Hobart Airspace Design Review consultation period, we have undertaken a comprehensive process to develop the final flight path design. We have carefully analysed and considered all the feedback and submissions received during the consultation period. The final design has been shaped by feedback from the community, delivering a range of safety enhancements and operational efficiencies, while minimising the effect of aircraft operations on communities and the environment, wherever possible. We invite you to read the Hobart Airspace Design Review Final Report, which contains the final design and consideration of feedback. Our community engagement activities in support of the final design will include on-site community updates in the Hobart area in May 2019, and community specific fact sheets. Further information regarding dates and locations will be provided on the website shortly. Thank you to all who have provided feedback during the Hobart Airspace Design Review. Airservices released the Hobart Airspace Design Review – Proposed Design Feedback Consultation Summary Report on 7 March 2019 and invited community members who provided feedback during the consultation period to review the report to ensure that their feedback was accurately reflected. Correction: where a correction has been requested that is a matter of fact and not opinion about accuracy of analysis based on partial access to all the information, the correction has been verified against records, and acted upon accordingly to amend or not amend the report. Opinion: where an opinion is expressed about accuracy of analysis based on partial access to all the information, the analysis has been checked against the data and reviewed for accuracy, and acted upon accordingly to amend or not amend the report. Clarification: where clarification has been requested, the items have been reviewed and acted upon accordingly to amend or not amend the report. Airservices has also received feedback on the Hobart Airspace Design Review – Stakeholder Reference Panel 2 Summary Report (October 2018), which has been incorporated. Click here for the updated report. Airservices thanks everyone who has provided feedback on these documents. Airservices conducted consultation on the proposed Hobart Airspace Designs between 31 October 2018 and 21 December 2018, with written submissions received until 7 January 2019. This included consultation with community, and industry stakeholders (including airlines, airports and general aviation operators). The industry feedback has been consolidated into the Industry Consultation Feedback Summary. Airservices conducted consultation on the proposed Hobart Airspace Design between 31 October 2018 and 21 December 2018, with written submissions received until 7 January 2019. A total of 277 submissions and responses were received from community members during this period. Verbal and written feedback was also received during 15 on-site consultation sessions held in the Hobart area (between 15 and 21 November 2018). These community submissions, responses and feedback have been consolidated into the Hobart Airspace Design Review – Proposed Design Feedback Consultation Summary Report. Community members who provided feedback during the consultation period are invited to review the report to ensure that their feedback has been accurately reflected. Please note that consultation on the proposed designs closed on 7 January 2019 and that, in the interests of transparency and fairness, additional or further feedback cannot be accepted. Consultation was also undertaken during this period with other stakeholders, including airlines, operators and other industry representatives. A summary of the other stakeholder feedback will be provided on the website on 7 March 2019, including the release of the Stakeholder Reference Panel #2 Summary Report. Airservices is currently conducting an analysis of all of the stakeholder feedback and will provide a report on how this feedback has been considered in the development of the final Hobart Airspace Design. The Consideration of Feedback report will be released in late March 2019. Airservices has prepared Fact Sheets for specific communities located within areas affected by proposed flight path designs. The Community Specific Fact Sheets are available below. Airservices will be available to discuss this material in more detail at the on-site consultations to be held between 15 and 21 November 2018. Airservices is pleased to have engaged Tania Parkes Consulting to assist in this next phase of community consultation and engagement. *Due to the extension of the community consultation period to 21 December 2018, these dates are currently under review. Please refer to the Hobart Airspace Design Review Timeline (December 2018). Airservices introduced flight path changes at Hobart Airport on 14 September 2017. These changes were made to organise aircraft movements onto standard routes, as previously, each aircraft was given an individual heading by air traffic control. As traffic volumes continue to increase it becomes more complex for air traffic controllers to deal with each aircraft individually in this way. Airservices carefully considered concerns raised through community feedback about the flight path changes implemented on 14 September 2017 and conducted a review of alternative flight paths. A report outlining why the changes were made, alternative flight paths considered and community feedback are contained in Review Report Hobart Runway 30 STAR. Airservices is now undertaking a further review, Hobart Airspace Design Review, of the Hobart Standard Instrument Arrival (STARs) and Standard Instrument Departure (SIDs). Terms of Reference for the review can be found below. Airservices is committed to consulting with the community and other stakeholders throughout the review process. It is anticipated that the review will take approximately 12–18 months to complete. Airservices implemented standard arrival and departure flight paths at Hobart Airport from 14 September 2017. Changes to flight paths are made for a variety of reasons, including for safety and efficiency improvements. Changes at Hobart were implemented to assist air traffic control with separation standards thus reducing complexity and workload for controllers and pilots. As traffic levels increases, the standardisation of flight paths is a key safety measure which reduces complexity for pilots and air traffic controllers. These changes build separation standards into the airspace design for departing and arriving aircraft and enable pilots to improve fuel management and reduce emissions with the use on board systems. In 2017, on average, there are around 30 arrivals and 30 departures each day at Hobart Airport. The flight paths that are used on any given day depend on which runway is in use. The runway direction used depends on the wind and other factors, with Runway 30 tending to be used more than 50 per cent of the time. For the changes shown in the maps residents will experience aircraft movements depending on direction of the wind and runway in use. Some residents will notice a change in where departing and arriving aircraft are tracking, as aircraft track with greater consistency. The maps and images below show the changes to where aircraft will be tracking. Airservices introduced changes to arrival and departure routes at Hobart Airport on 14 September 2017. Following consideration of concerns raised by the community regarding changes to the arrival flight path to Runway 30, Airservices conducted a review to identify and assess possible safe and feasible alternatives flight paths. The report of the review, Review Report Hobart Runway 30 STAR, November 2017, concluded that Airservices will implement the ‘Alternative 2’ flight path. ‘Alternative 2’, arrival path as shown in the review report, will become effective on 1 March 2018. This new flight path will provide an improved noise outcome for some areas that are currently affected by aircraft noise. Given Airservices requirements to consider safety as the most important consideration and the regulatory requirements to utilise satellite based navigation, Standard Instrument Departures and Standard Instrument Arrivals must continue to be utilised at Hobart Airport to ensure the travelling public continue to receive the best level of air traffic control service with the safest outcomes. Flight paths must also allow the efficient sequencing and management of aircraft in the broader network by air traffic control, and minimise fuel burn and emissions as much as possible. Residents of Primrose Sands are not likely to be directly overflown however they may notice changes to the tracking of departing aircraft and an increase in the consistency of this tracking. Residents in the Connellys Marsh area are currently overflown, however they may notice changes to the tracking of departing aircraft and an increase in the consistency of this tracking. Aircraft are at approximately 8000 to 9000 feet in altitude. Noise levels over 60 decibels are possible for larger aircraft. New flight path show in yellow for aircraft arriving to Runway 12 from the north. No change to existing flight path shown in red (instrument approach). Residents in the Campania area are currently overflown, however they may notice changes to the tracking of departing aircraft and an increase in the consistency of this tracking. Aircraft will be at altitudes of approximately 4000 to 5200 feet over this area. 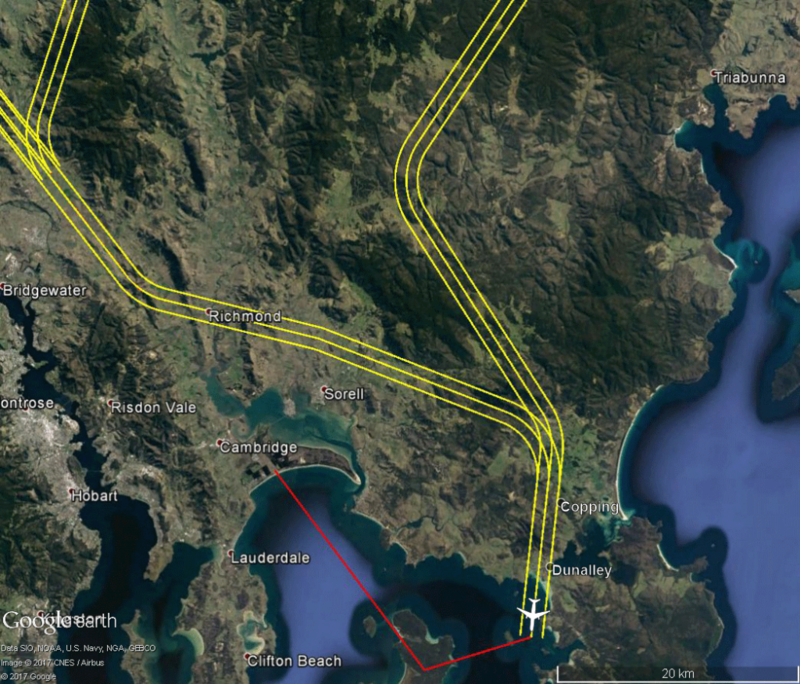 New flight path show in yellow for aircraft arriving to Runway 30 from the north. No change to existing flight path shown in red (instrument approach). Residents in the Dunalley and Copping will notice changes to the tracking of arriving aircraft and an increase in the consistency of this tracking. Aircraft are expected to be at altitudes of approximately 5000 to 6000 feet over these areas. During the Hobart Airspace Design Review Community Consultation period Airservices received feedback regarding the airspace design development process. 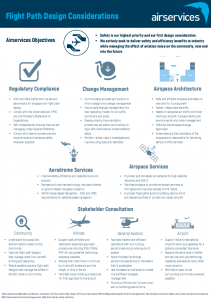 In response to this feedback, Airservices has produced a Design Development Process Fact Sheet. This fact sheet provides an overview of the process. We have received a number of submissions and responses, and will be consolidating them into the Proposed Flight Path Design Consultation Summary Report, due in February 2019. The Timeline below has been updated with quicklinks to reports and documents. The Community Consultation period for the Hobart Airspace Design Review closed on Friday 21 December 2018, and the extended period for written feedback submissions closed on Monday 7 January 2019. We would like to thank all stakeholders for their feedback. The Community Consultation period for the Hobart Airspace Design closes on Friday 21 December 2018. Airservices will accept written feedback submissions until Monday 7 January 2019. Please note that within the period from 22 December 2018 to 7 January 2019 we will be unable to respond to feedback and questions. The Community Consultation period for the Hobart Airspace Design Review has been extended until 21 December 2018. The proposed flight path designs are described in the Updated Proposed Flight Path Designs Fact Sheet (November 2018). The updated Fact Sheet reflects feedback provided by the community, and contains updated and additional maps, supported by additional explanatory text. We acknowledge that the original version uploaded on 31 October included material that required correction. Community Consultation sessions have commenced for the Airservices Hobart Airspace Design Review. An additional session is now available in Dunalley (Tuesday, 20 November, 12pm-2pm). Details of session times and locations can be viewed in the updated Consultation Schedule. Airservices will be conducting on-site consultation in the broader Hobart Area from the 15 to 21 November 2018. Details of the locations and times of consultations are available for download here. Airservices has undertaken a review of the Hobart Airport SIDs and STARs for Runway 12 and Runway 30, using a ‘greenfield approach’, with safety of air navigation as our primary consideration. While the current flight path design is safe, Airservices has identified opportunities to improve safety while minimising the effect of aircraft noise on the community, where possible. The proposed flight path designs are described in the Proposed Flight Path Designs Fact Sheet. How many aircraft will fly over my area? How will it be different from what I experience today? This material will be available on our website from Friday 9 November 2018. We will be available to discuss this material in more detail at the on-site consultations. On 4 September 2018, Airservices released the draft Community Engagement Plan prepared by Tania Parkes Consulting, with an online survey to enable the community to provide feedback on the plan. Airservices thanks all residents who provided feedback. A Community Engagement Plan Survey Results summary is provided. Some residents suggested additional methods for notification of consultation sessions, including the use of text messaging, local radio and community roadside notice boards, and these have been incorporated into the plan. Community consultation activities for the Hobart Airspace Design review are provided in the final Community Engagement Plan. On 14 September 2018, Airservices convened a Stakeholder Reference Panel as part of the Hobart Airspace Design Review consultation activities. The Stakeholder Reference Panel was chaired by a stakeholder engagement specialist, Dr Tania Parkes, and consisted of representatives from Clarence, Sorrel and Tasman local councils, state government, Tourism Tasmania, Hobart International Airport, Airlines, and community advocates from the Hobart Community Aviation Consultation Group, South East Coast Lifestyle Association and the Dunalley Neighbourhood House. The Stakeholder Reference Panel is an internationally recognised best practice model used to engage a diverse range of stakeholders on change and is being incorporated into consultation activities across a range of sectors such as transportation, utilities and mining. The aim of the Panel was to share and discuss the range of industry and community stakeholder considerations gathered to date from various consultation activities. The Panel was briefed on a number of flight path design constraints, including international and domestic regulatory requirements, operational requirements for aircraft, and the considerations nominated by industry and community stakeholders during recent consultations. Some additional considerations were presented by Panel participants and these will further inform our flight path design activity. The participation of key stakeholders in the Stakeholder Reference Panel is an important milestone for Airservices and the work being undertaken in Hobart. We thank everyone for their genuine engagement, thoughtful comments and feedback, and the collective goodwill to progress the upcoming community consultation in a meaningful way. The proposed flight path designs are being informed by the constraints and considerations mentioned above, and will be available on our website from 31 October 2018. Opportunities to provide feedback on the proposed flight path designs will be available until 27 November 2018, including face-to-face engagement in Hobart from 15 to 21 November 2018. Airservices will consider the feedback received from industry, government and communities before making a decision on the final flight paths that reflect our legislative responsibility of providing safe, secure, efficient, and environmentally-responsible air navigation services to the industry and the travelling public. To inform the Hobart Airspace Design Review, on 14 and 15 June 2018 Airservices undertook initial community consultation in Hobart to establish a plan for community engagement and document social impacts of the Hobart flight path changes. This consultation activity has produced two documents: Social Impact of Hobart Airspace Changes (September 2017/March 2018) Consultation Summary Report (August 2018) and draft Community Engagement Plan (August 2018), prepared by Tania Parkes Consulting for Airservices. The survey is anonymous and can only be completed once per person. The survey will be open from 4 September – 18 September 2018. The finalised Community Engagement Plan will be provided on the Airservices website on 28 September 2018. The draft Community Engagement Plan has informed the development of Airservices stakeholder engagement activities. Please see below for community consultation and feedback key dates. To commence the next stage of stakeholder engagement and consultation in Hobart, and in accordance with the draft Community Engagement Plan, Airservices will host a Stakeholder Reference Panel to meet in advance of the broader community consultations for a day of facilitated discussion and consultation. 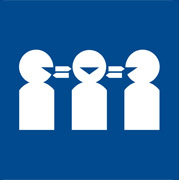 Representation is by invitation to ensure key stakeholders and community advocates are provided with an opportunity to better understand the regulatory, technical, operational, and community considerations for Airservices’ flight plan designs, and to enable the sharing of a range stakeholder views in a small group format. It was originally envisaged that proposed flight path designs would be ready for community consultation in August 2018 but they will not be ready now until October 2018. This work is technical and complex and is taking longer than anticipated but it is important that we get it right. Airservices received a large number of responses from the community following the consultation in June 2018. We are still working through the statements and views provided by the community, and hope to publish these within the next two weeks. With safety as our primary consideration, the Hobart Airspace Design Review is considering design options starting from a ‘blank sheet of paper’ which will be informed by the feedback from the community, industry and government stakeholders within the constraints of our operational and regulatory requirements. We expect to provide an update which will include the community Consultation Summary Report, draft Community Engagement Plan for feedback via an online survey and proposed consultation periods within the next two weeks. Following consideration of this feedback, we are planning to commence community consultation in October 2018 on proposed designs. Consultation dates will avoid the Spring School Holiday period. If you have any questions or require further information, please contact the Noise Complaints and Information Service on 1800 802 584 or https://complaints.bksv.com/asa. On 14-15 June 2018 we undertook consultation to inform the Hobart Airspace Design Review. Airservices retained a community engagement specialist and social planner to identify social impacts to inform the Airspace Design Review and to assist in designing a Community Engagement Plan that will be used as the basis for consultation with a broader demographic in August 2018 when Airservices presents the initial findings of the Airspace Design Review. The consultations provided opportunity for stakeholders and community members to participate in the co-design of the Community Engagement Plan and to meet community engagement specialist and social planner Tania Parkes. Thank you to those who either attended the consultations or provided information following the consultations. A copy of the information sheet provided at the consultations is available on this webpage (under Downloads). The Draft Community Engagement Plan will be available shortly. Once the Engagement Plan is finalised, Airservices will provide further information on the consultations for the initial findings of the Airspace Design Review. We are progressing consultation with stakeholders to inform the Hobart Airspace Design Review. Airservices has retained a community engagement specialist and social planner Tania Parkes to identify social impacts to inform the Airspace Design Review and to assist in designing a Community Engagement Plan that will be used as the basis for consultation with a broader demographic in August 2018 when Airservices presents the initial findings of the Airspace Design Review. Stakeholders and community members are invited to attend the consultations listed below to participate in the co-design of the Community Engagement Plan and to meet community engagement specialist and social planner Tania Parkes. 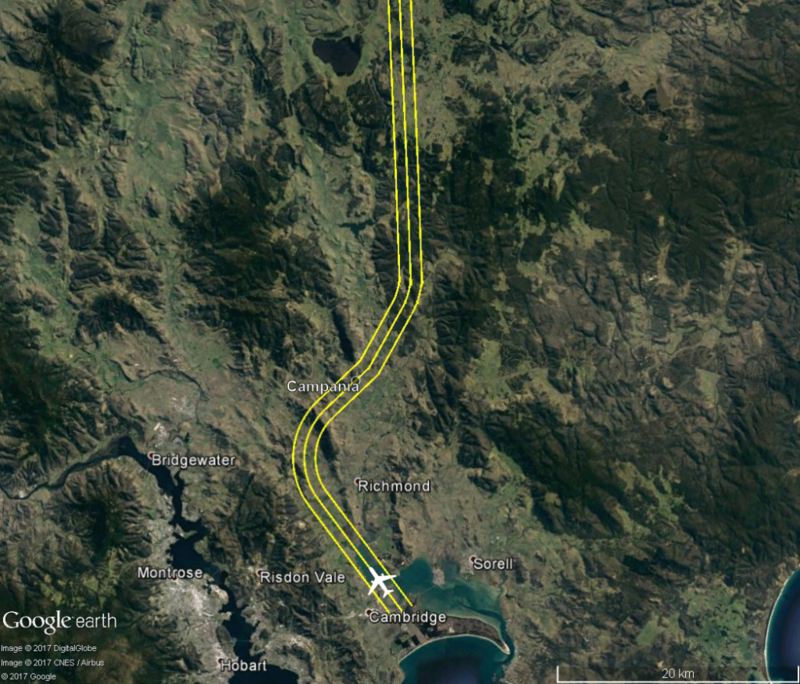 The Aircraft Noise Ombudsman (ANO) has released the report Investigation into complaints about the introduction of new flight paths in Hobart April 2018. Airservices response can also be found at the end of the report. As part of a proactive approach to managing issues associated with implementing flight path changes, Airservices has completed an internal review into its processes associated with aircraft noise management. This internal process review was conducted to provide an assessment of performance against key policy and procedural documents and provide recommendations for improvement. This review identified 29 actions, all of which were implemented by the end of March 2018. The report Review into processes associated with aircraft noise management will form part of Airservices commitment to continuous improvement and inform the management of the introduction of flight path changes into the future. Stakeholder consultation to support the Hobart Airspace Design Review, of the Hobart Standard Terminal Arrival Routes (STARs) and Standard Instrument Departure routes (SIDs) will commence with initial discussions in late May, early June 2018. This first phase of consultation will allow all stakeholders to understand and provide input into the consultation process and establish the most appropriate format for engagement during 2018. A second round of consultation will be held to present a draft engagement plan developed from discussions during the initial consultation phase. A third consultation round is planned for August 2018 where in depth engagement will follow the presentation of initial findings of the technical review of flight path options. Details of the arrangements for the first phase of consultation will be available here shortly. Airservices introduced changes to arrival and departure flight paths at Hobart Airport on 14th September 2017. The changes were designed to organise aircraft departing from, or arriving into, Hobart Airport onto standard routes called Standard Instrument Departures (SIDs) and Standard Instrument Arrivals (STARs). Airservices committed to a further review of the Hobart SIDs and STARs. Access the Terms of Reference (below) for the review. Airservices has carefully considered the concerns raised in community feedback about the flight path changes implemented on 14 September 2017. A review identified a number of alternative flight paths. A report on why the changes were made, alternative flight paths considered, community feedback and Airservices decision are outlined in Review Report Hobart Runway 30 STAR. At today’s Community Aviation Consultative Group meeting at Hobart Airport, it was announced that following a review of changes made to flight paths at Hobart Airport, that Airservices intends to implement Alternative Flight Path 2 based on safety, air traffic management and community feedback. This implementation is planned to be completed in March 2018, due to the requirement to publish the procedure in aeronautical documentation and provide airlines with sufficient time to program flight management systems. A full report of the review will be made available on the Airservices website by the end of this week. Airservices will now undertake a further review of the Hobart Standard Terminal Arrival Routes (STARs) and Standard Instrument Departure routes (SIDs) with terms of reference to be published by the end of January 2018. Airservices is committed to consulting with the community and other stakeholders throughout the review process. It is anticipated that the review will take approximately 12–18 months to complete. 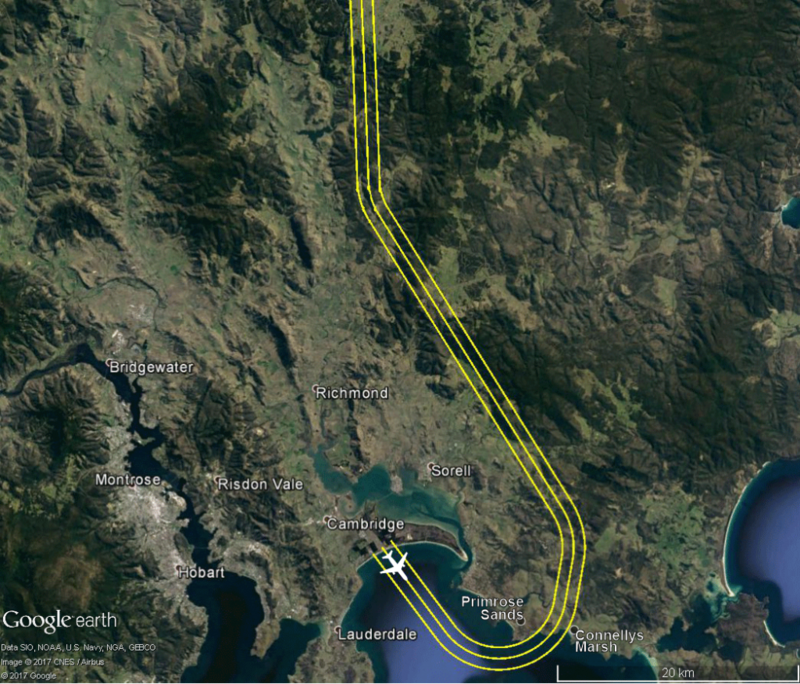 is now available on our Review of arrival flight path to Hobart Airport page. In response to requests we are extending the hours of the community consultation drop-in session on 11 November 2017 at Dunalley House, 172 Arthur Highway, Dunalley. The session will now run from 11.15am until 3pm. You are welcome to attend at any time between these hours. On arrival small groups of up to 10 people at a time will be given an introduction of around 15 minutes by Manager Southern Operations, Steve Clarke. These introductions will run consecutively throughout the session. After the introduction three specialists will be on hand to discuss issues and answer questions in more depth with individuals and small groups. As the venue size is limited, it would be greatly appreciated if you would register your intention to attend and include an indication of what time you may arrive. We will use this information to limit any waiting times as far as possible. Please register by calling the NCIS on 1800 802 584 or by using our online form. As part of our review of the arrival flight path over Kellevie, Copping, Dunalley and Boomer Bay, Airservices is seeking feedback from the community on safe and feasible flight path alternatives that may reduce the impact of aircraft noise over these areas. A community consultation drop-in session will be held on 11 November 2017 at Dunalley House, 172 Arthur Highway Dunalley between 11.15am and 3pm and you are welcome to attend at any time between these hours. If you are available to attend, we encourage you to register by calling the NCIS on 1800 802 584 or by indicating your intention to attend using our online form. Airservices have carefully considered the concerns raised in community feedback about the flight path changes implemented on 14 September 2017. A review has commenced to assess and identify possible safe and feasible alternatives that would reduce aircraft noise impact on residents. In assessing possible options, safety will be our highest priority while seeking every opportunity to minimise and where possible reduce the impact of aircraft noise. The review will take several weeks and we will provide updates here regarding expected timelines. Feedback can continue to be submitted to the Noise Complaints and Information Service. When designing these new flight paths, Airservices conducted an environmental assessment in accordance with Commonwealth regulatory requirements and Airservices environmental standards and procedures. The report Environmental Assessment of Hobart Airport – Proposed SIDs & STARS June 2017 is available below.